Texas harvests nearly 2 million acres annually. The cash value to farmers is $514 million, which generates $1.7 billion for Texas. 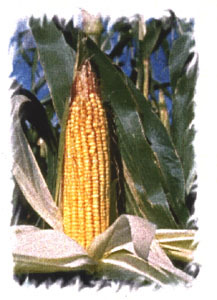 Both food- and feed-grade corn are produced, due to favorable environmental factors. Bt corn has been rapidly adopted in the High Plains where stalk borers are a problem. Integrated pest management, including crop rotation and planting resistant hybrids are commonly practiced. 66% of acreage is scouted and insecticides are applied based on economic tresholds. Soil insects are major pests in southern areas. Foliar insects and stalk borers are more common in the High Plains. Major insects include spider mites, European and southwestern corn borers, western corn rootworm, Mexican rootworm, corn earworm, and fall armyworm. Bifenthrin (Capture) is used to control borers and mites. Permethrin (Pounce, Ambush) and esfenvalerate (Asana) are also used. Carbofuran (Furadan- a carbonate), chlorpyrifos (Lorsban- an OP), dimethoate (Cygon- an OP), and terbufos (Counter- an OP) are commonly used but are targeted for review under FQPA. Corn hybrids are bred for genetic resistance to most diseases. Crop rotations and planting disease- resistant hybrids reduce disease impacts. Seed is treated but no fungicides are applied in the field. Weed control is the primary concern of corn producers. 83% of all pesticide used in corn is aimed at controlling weeds. 82% of the producers rotate fields. Mechanical cultivation, adjusted planting and harvesting dates, and herbicide use are common weed control practices. Pigweed, annual grass, several perennial broadleaf weeds and johnsongrass are major problems. Atrazine is the primary herbicide and is used on 70% of the corn acreage. Atrazine is a mainstay herbicide but its use is under review by the EPA. Other herbicides commonly used include metolachlor (DUAL), dicamba (Banvel), nicosulfuron (Accent), and dimethenamid (Frontier). Public and private breeding programs strive to improve insect and disease resistance. Independent crop advisors check most corn fields. Chemicals are costly, so use is based on scouting, pest presence, and expected markets. Crop Briefs is an information series developed by Texas A&M AgriLife of the Texas A&M University System on critical pest problems and pesticide needs for Texas agriculture. This effort is supported by the Texas Corn Producers Board, and other commodity groups. Dr. Dudley Smith, Texas Agricultural Experiment Station and Dr. Juan Anciso, Texas AgriLife Extension Service prepared these reports August 2000 using information from numerous sources. Departmental Report SCS-2000-01.The information given herein is for educational programs only. Reference to commercial products or trade names is made with the understanding no discrimination is intended and no endorsement by the Texas AgriLife Extension Service and the Texas Agricultural Experiment Station is implied.